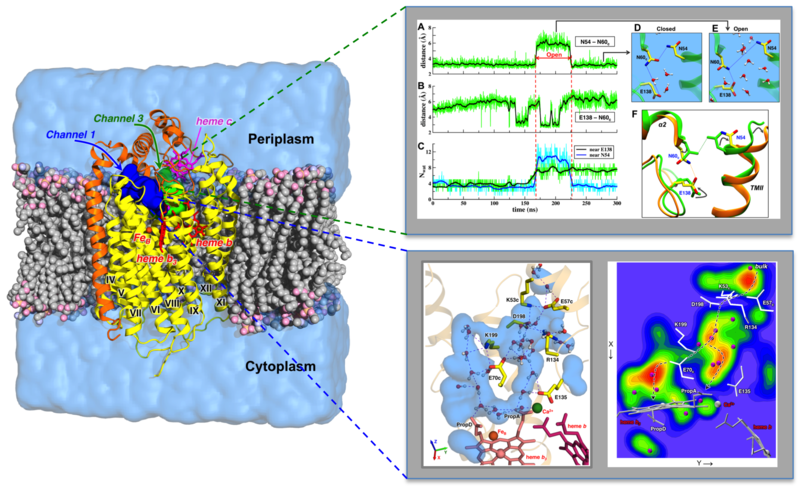 We conduct computational research to explain and predict the functioning of protein complexes that are important in key biological processes, such as cellular energy conversion, molecular transport, and enzyme catalysis. The action of these complex "biomolecular machines" is often intrinsically coupled to the proton and ion translocations across various membranes. Examples include proton and ion pumps and channels, respiratory and photosynthetic complexes. To tackle these challenging problems, we employ a range of computational methods, extensively use supercomputers, and work in close collaboration with experimental groups. Proton pumps, one of the foci of our current research, are an essential part of the energy production in living cells. They are membrane protein complexes that move protons from one side of the membrane to the opposite, against the electrochemical gradient, as e.g. in the processes of cellular respiration and photosynthesis. In the respiratory complexes of the electro-transport chain, the proton translocation is driven by redox reactions. Understanding the molecular mechanism of such energy coupling is a fascinating ongoing challenge of modern biophysics, biochemistry and structural biology. The efforts are also of biomedical importance, as the mitochondrial proton pumps are implicated in the most common human neurodegenerative diseases and ageing, while bacterial respiratory complexes have come into focus as a promising new target for the development of antimicrobial drugs.